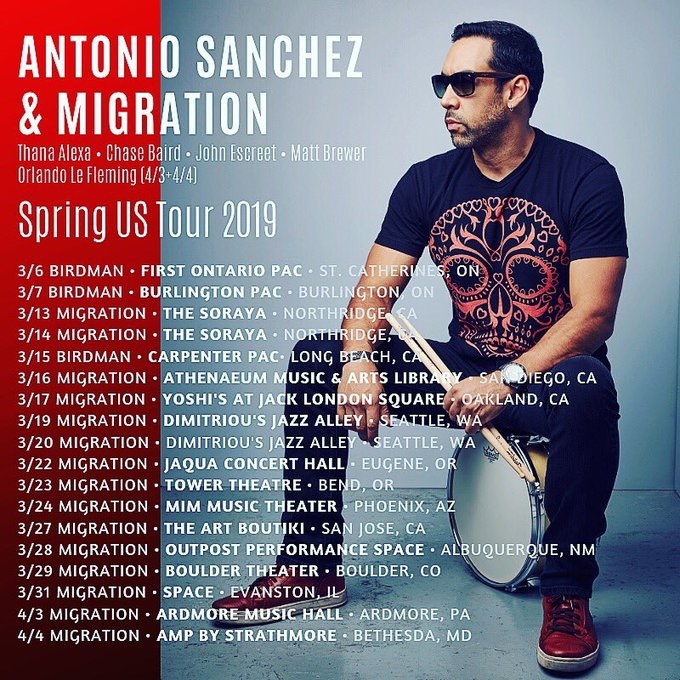 (HOLLYWOOD PRESS CORPS) — MARCH 13TH, 2019 — Top jazz drummer and four time Grammy winner, Antonio Sanchez, performed at the Younes and Soraya Nazarian Center for the Performing Arts on CSUN Campus in Northridge. This space, known as the Soraya, is the crown jewel of performance spaces in the San Fernando Valley. It’s a rare treat to see jazz on this level, and to hear it at the Soraya makes it twice as special. 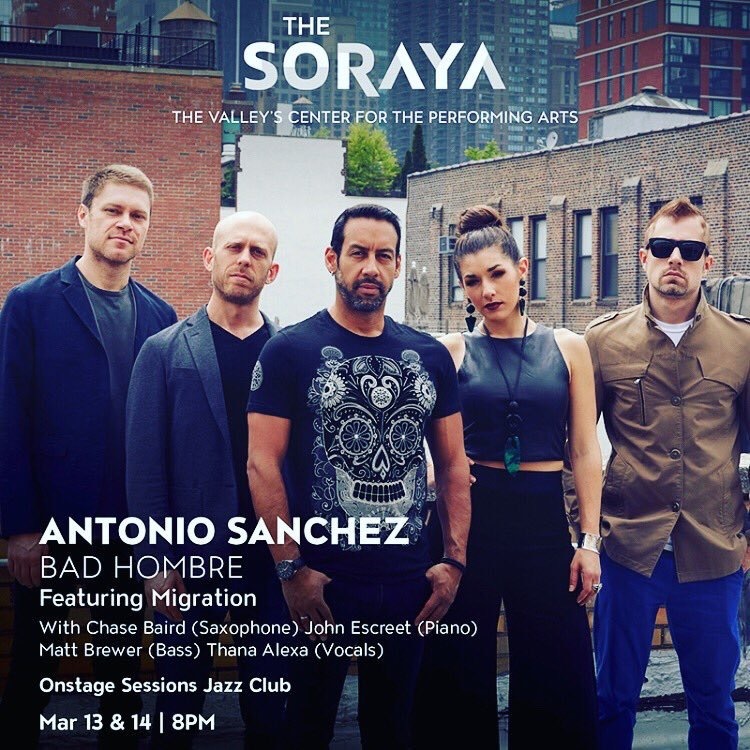 The Soraya Leadership Series With Antonio Sanchez was an on campus event that brings prominent artists and students together. This was a great chance for the students at CSUN to listen to and learn from a master level artist. 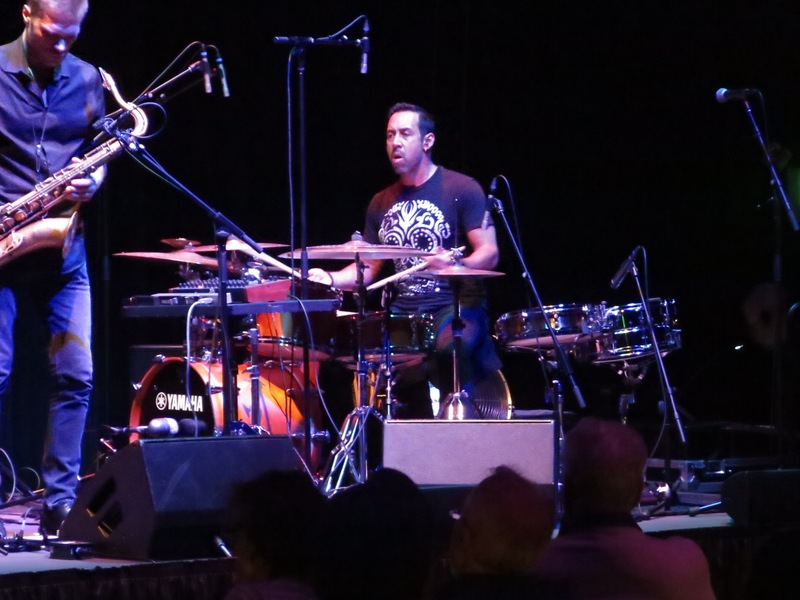 Antonio Sanchez is known as one of the top jazz musicians in the world. His all percussion sore from the movie “Birdman” also known by the title “The Unexpected Virtue of Ignorance” was revolutionary and ground breaking. Antonio is an immigrant to America from Mexico. He know lives in New York City with his wife Thana Alexa, who is a jazz vocalist. Antonio has been performing his “Birdman” album to sold out crowds. On Wednesday at the Soraya, Antonio preformed with his band Migration. Migration had Chase Baird on saxophone and EWI. An EWI is an ElectronicWind Instrument or a “Wind Synth”. 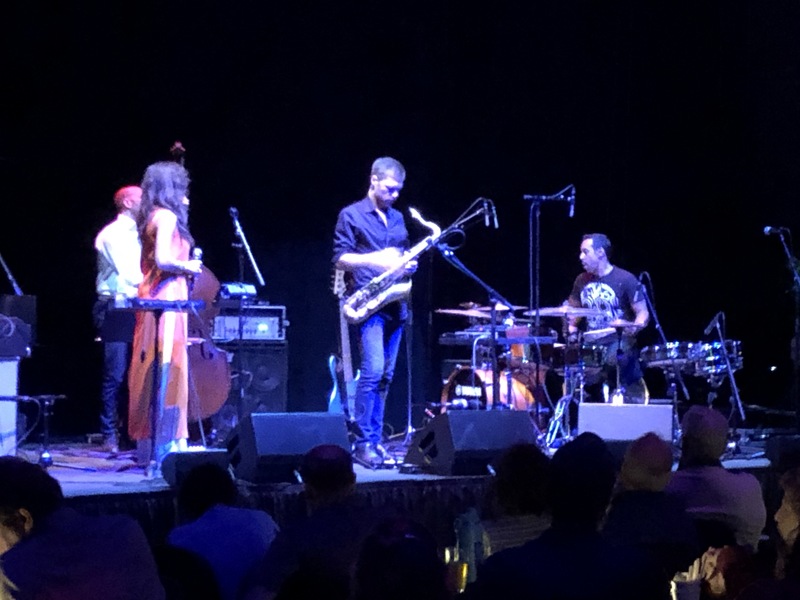 John Escreet on piano and organ, Matt Brewer on upright bass and five string electric bass and of course, the talented Antonio Sanchez on percussion. The Soraya, is a Taj Majal of performance spaces for the Valley. Its on the CSUN campus. Parking can be tricky. The security is tight and plentiful. Once we figured out where to park and how to check in, we entered the stage area of the auditorium. A stage was on one end with tables and a riser at the other end. The sound and the lighting are just amazing. The dynamics of the sound system are just top of the line. Antonio and the band got down to business with a couple of tunes off of the “Lines In The Sand” album. They played “Home” which is great tune. I really liked Chase Bairds upright bass playing on the first few tunes. He switched to electric bass later but I think I liked the upright more. They also played “Travesia” and “Long Road”. Antonio took some time to talk about his experience as an immigrant. His love for news. He talked about being sworn in as an American citizen. He said now that he cant be deported, he has to be careful about getting in trouble because hell have to answer to the authorities in the states now. He said he’s in a sort of limbo where he no longer feels like a Mexican citizen but is still new to being an American. I really enjoyed Migration’s performance. Antonio is such an amazing drummer. One can almost hear Antonio speaking words with each expressive beat and cymbal hit. A question here, a statement there. Antonio has a passion for music. He took some time between tunes to talk about the immigrant experience. He spoke about immigrants who aren’t so lucky. People who flee their homes out of fear, persecution, war and famine. He also talked about people who get detained by ICE, but they are American citizens. All of these things are what Antonio is putting in his music. His band Migration is the next level for this master level composer. Working with the best jazz musicians of New York City, Antonio has created a jazz band that is capable of expressing his feelings and questions. 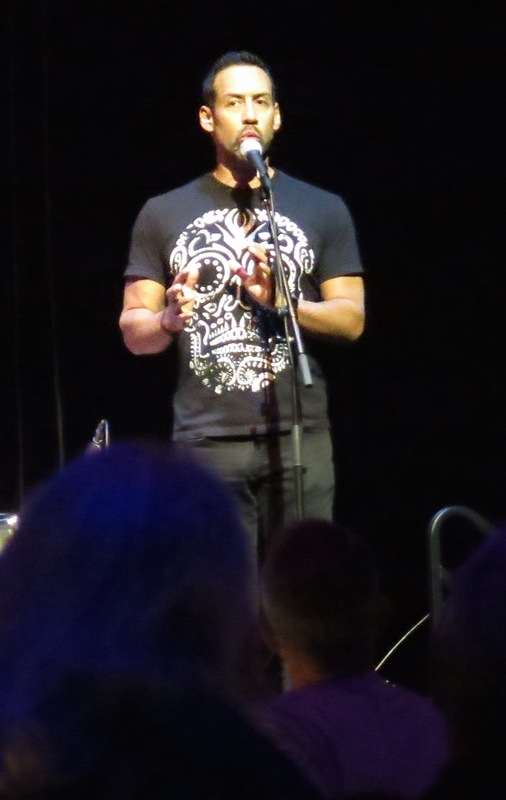 The Hollywood Press Corps was honored to attend the Antonio Sanchez concert featuring Migration. We look forward to future events at the Soraya.